Researchers of the Central Institute of Economic Management (CIEM) have proposed the Government levy special consumption tax rate for bio-fuel equal to half of the rate for gasoline. The recommendation was part of a CIEM survey, which was announced at the seminar on using tax policies to regulate the economy towards green growth and sustainable development held in Ha Noi yesterday. 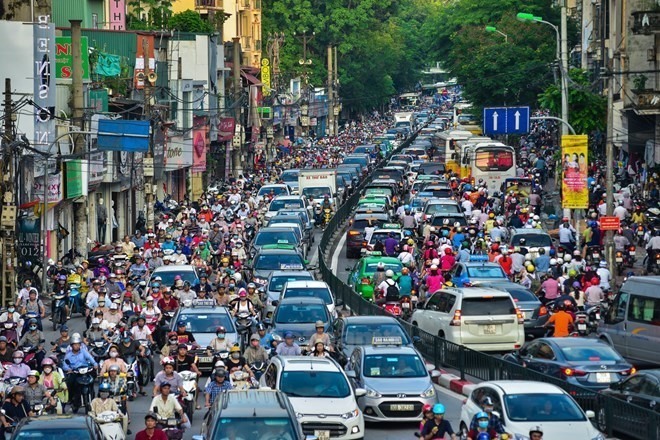 Head of the CIEM`s Social Affairs Department Nguyen Manh Hai said the hike of special consumption tax rate for bio-fuel would create a significant difference in the selling price between bio-petrol and petrol, encouraging people to use the bio-fuel to protect the environment. "It`s also needed to maintain and increase the special consumption tax on cars and fossil fuels to limit the consumption of these products in Viet Nam," Hai said. He said that green growth and sustainable development in many countries aimed at reducing CO2 emissions, developing green technology and industries using less resources and applying clean production methods by asking manufacturers to transfer environmental protection costs into product costs, encouraging them to invest in environmental protection. "In our country, many tax policies have been designed towards green growth targets such as exemption of corporate income tax for income from the transfer of emission reduction certificates; applying tax rate of 10 per cent on the corporate income from implementing activities in the environment and tax incentives for green consumer product manufacturers," Hai said. However, these taxes are not strong enough. The tax policies aiming to limit production and consumption of goods causing harm to the environment are not appropriate compared with reality. Revenues from these taxes are not commensurate with losses caused by production and consumption activities, he added. In terms of value-added tax, Hai said the Government needed to amend the policies towards zero tax on the maintenance of zoos, parks and street greenery and public vehicles like bus and tram. Secretary of the Prime Minister`s economic advisory team Dang Thi Thu Hoai proposed increasing the tax rate on products or waste damaging the environment such as chemical fertilisers and emissions. Deputy Director of CIEM Nguyen Thi Tue Anh said green growth was always a hot issue, in which tax policy needed to encourage green and clean production. However, it was not easy to implement these policies effectively.